Business has broken out of the office. Teammates can join meetings remotely via video conferencing tools; mobile devices keep coworkers in touch between appointments; and the lines between personal and professional commitments are becoming increasingly blurred. Simply put: the way we work is evolving. So why are we still trying to cram in all of our work between the hours of 9a.m. and 5p.m.? In fact, recent surveys indicate that even workers across industries that have typically followed the “traditional” eight hour work day – including information technology, sales and professional services – are beginning to consider it an outdated concept. 9 to 5 workweeks are more often than not set in place out of tradition; this generally accepted scheduling system was not developed to specifically fit the needs of your team. Therefore, when developing a new schedule, be sure to keep in mind the capabilities and preferences of who you are working with. For example, questions like, “How comfortable are you with technology?” and, “During which hours of the day do you feel most productive?” can give insight into fellow employees’ ideal working conditions. Recent advances in workplace technology have opened the doors to countless opportunities for productivity outside of the traditional office setting and workweek restrictions. E-mails cause cell phones to instantly chime with alert notifications and project details can be accessed with the swipe of a screen. Take some time to discuss the technology available to you and your team, and determine ways to leverage these tools to better schedule your time. For example, rather than arranging travel details for a recurring meeting between offices, determine if you have the capability to develop a video conferencing plan to free up time and cut down on costs. However, it is important to note that while technology has pushed the boundaries of the work week outside of its schedule, there comes a point when it can make work hit too close to home. When discussing options for expanding your team’s use of technology, be sure to respect coworkers’ personal space and free time. Modern employees have learned that they do not necessarily need to be working at the same time, or even at the same physical place, as their coworkers in order to complete necessary tasks. This new found independence can empower teammates to develop plans of execution based on their own time and preferences. Yet, it is still extremely important to develop a team culture and incorporate regular check-ins as a team. If you’re considering a switch to a schedule that incorporates more remote work, balance out these times of individual work by coming together as a full team multiple times a week. Whether this session is conducted in-person or virtually, make the commitment to devote meaningful time to discussing team concerns, checking in on goals and generally reconnecting. Four cubicle walls, five weekdays and eight hours a day are not enough to hold back work anymore. Rather than attempting to force schedules into a one-size-fits-all calendar, consider making some changes to better match the needs of your team. 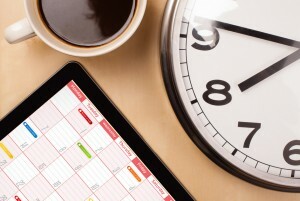 Do you have any ideas for mixing up the traditional workweek schedule? We’d love to hear them below! This entry was posted in Currently Employed and tagged 9 to 5, flexhours, management advice, technology advice, virtual meetings, work schedule, Work-Life Balance, working from home. Bookmark the permalink.